The next Martian simulation will be held in February 2013, in Morocco, North Sahara. ABM Space Education Sp. z o.o. from Toruń together with Austrian Space Forum (OeWF) will be one of the simulation participants. The Ibn-Battuta Centre from the Marrakesh University will be a partner of the expedition. ABM Space Education technologically supported by TME, will have taken in this type of test for the second time (for the first time, the ABM Sp. z o.o. Martian robot was tested in ice caves of Dachstein, Austria). During the expedition that will take place in February, experiments will be conducted with the use of Magma White robot. Scientific equipment allowing remote biophysical measurements will be installed on its board. 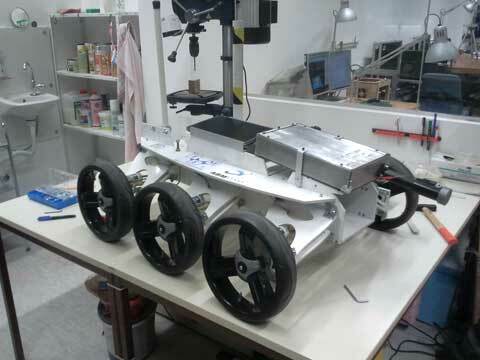 Furthermore, remote control tests of robot will be performed with the use of satellite connection. The test assumes that the robot located on the dessert will be controlled from the Mission Support Centre situated in Innsbruck, Austria. In December 2012, L.I.F.E. equipment was configured. This equipment will be installed on the robot and will be used to collect spectra characteristics of the analysed subsoil. Representatives of the Polish “Martian team” have transported the robot to Austria in order to perform mechanical and electrical configuration of research equipment provided by other participants of the Morocco expedition. In January the robot was sent to Morocco, where is now awaiting acceptance and beginning of tests.